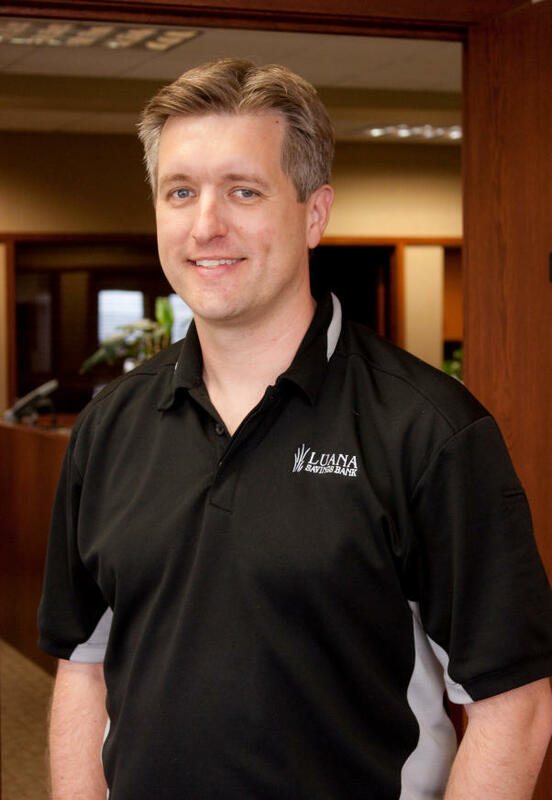 The Iowa Finance Authority today announced that Luana Savings Bank has been named Agricultural Bank of the Year and Steven Ruzicka of Luana Savings Bank has been named Agricultural Loan Officer of the Year. The awards recognize the bank and loan officer with the highest amount loaned to beginning farmers through the Beginning Farmer Loan Program in 2018. "I congratulate Luana Savings Bank and Steven Ruzicka for this well-deserved recognition honoring their commitment to assisting beginning farmers," said Iowa Finance Authority Executive Director Debi Durham. "Last year alone, we assisted nearly 100 farmers in purchasing a total of 5,600 acres as well as machinery, equipment and livestock, an accomplishment that would not be possible without outstanding partners like the team at Luana Savings Bank." "The Iowa Finance Authority's Beginning Farmer programs are vital to assisting farmers at the onset of their careers, so they can continue our state's rich agricultural history," said Steven Ruzicka of Luana Savings Bank. "We’re honored to receive this recognition and look forward to helping even more farmers in the years to come." The Beginning Farmer Loan Program provides low-interest loans to assist new farmers in acquiring agricultural property. Beginning Farmer Loans are financed by participating lenders or contract sellers with federal tax-exempt bonds issued by the Iowa Finance Authority. The interest received on contract sales or direct loans by individuals is also exempt from state income taxes. 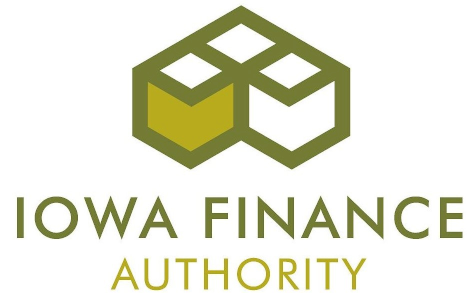 The Iowa Legislature created the Iowa Finance Authority in 1975 to undertake programs to assist in the attainment of housing for low- and moderate-income Iowans. Since then, the Iowa Finance Authority's role has grown to include affordable housing, water quality and agricultural development programs. Luana Savings Bank has been featured once again as one of Bauer Financial's "50 Most Efficient Community Banks" nationally. To make the list, Bauer Financial requires certain capital ratios and star ratings, and the bank must be classified as "well capitalized" by Federal Regulators. The ranking system is based on financials for June 30, 2018 as reported by federal regulators, published in Bauer Financial's Jumbo Rate News 35:41 p7. Bauer Financial is an independent bank research firm reporting on and analyzing the performance of U.S. banks and credit unions since 1983. Bauer Financial is not affiliated with Luana Savings Bank. Learn more online at www.bauerfinancial.com. 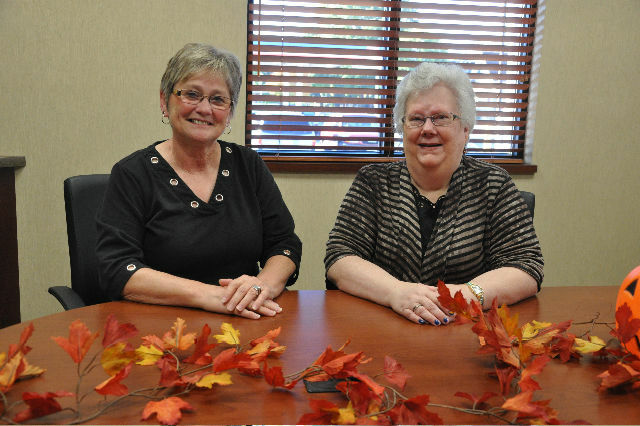 Judy Hoffman & Colleen Leichtman of Luana Savings Bank in New Hampton were each recently honored by the Iowa Bankers Association (IBA) for more than 50 years of service at a bank. They were recognized during the IBA Annual Convention on Sept. 18 in Des Moines. Judy and Colleen were two of twenty-one individuals recognized for reaching the 50-year milestone. "Iowa banks have been a trusted resource for Iowans for more than 100 years. We are honored to have the commitment and experience of bankers like Judy and Colleen, who have worked to provide valuable service to Iowa bank customers and their communities for more than half a century," said IBA President and CEO John Sorensen. Both Judy and Colleen started their careers in banking immediately out of high school in the mid-60's. Both are retired now, but with their commitment to the field they have seen many changes in the banking industry throughout their tenure. Luana Savings Bank in New Hampton first started out as First National Bank which later changed to First State Bank. Luana Savings Bank took ownership in 2008 and is here to stay. The dedication of past and present employees to their jobs and community is truly an asset to every customer. The Iowa Bankers Association represents Iowa banks and savings institutions. Iowa Bankers are committed to the values of honesty, hard work and community service, and have been a trusted resource for Iowans for more than 100 years. Iowa banks offer FDIC insurance and lend more than $82 billion to help individuals, business owners and agriculture. More than 30,000 Iowans work at an Iowa bank and bank employees volunteer more than 300,000 hours to support local communities each year. To learn more, visit www.iowabankers.com. Luana Savings Bank has announced a new branch facility and 150 occupancy community center in Norwalk, IA. The new facility is a sign of our gratitude for local support - past, present, and perpetually into the future. The new facility will allow our staff to better serve existing and new customers. The new Norwalk facility marks our third new construction featuring a community room in three years, with more than half of our branches featuring community meeting rooms. As Luana Savings Bank continues to grow, we also deepen our roots in the local communities that we serve. Luana Savings Bank is happy to announce the promotion of Jess Schubert to a Mortgage and Consumer Loan Officer. Jess and her family have lived in the Luana/Monona area all her life. She currently volunteers as a high school girl's basketball coach at MFL MarMac and is involved as a volunteer for other school clubs, committees, and town events. Jess has served at Luana Savings Bank's Luana office since 2007 in several capacities which include customer service. Since 2011 she has worked in the Loan Processing Department where she has gained extensive knowledge in the field. Jess commented, "My 11 years at Luana have already given me the opportunity to work with many area families. I look forward to continuing these relationships by helping local residents achieve their home visions and consumer needs." 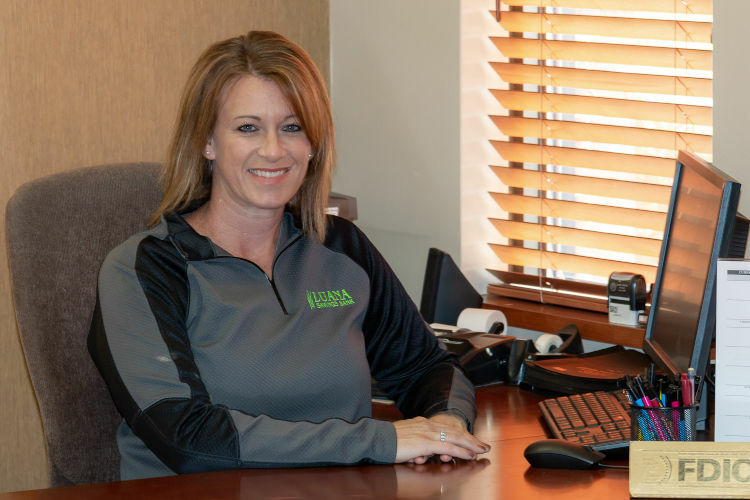 Jess's local presence and exceptional service skills will greatly benefit the community and anyone seeking her financial advice and abilities at Luana Savings Bank. Luana Savings Bank has moved ahead 8 positions as ranked nationally by the American Banker's Association (ABA) in their "Top 100 Farm Lenders Ranked by Dollar Volume" list, which currently also includes 29 other Financial Institutions throughout Iowa. 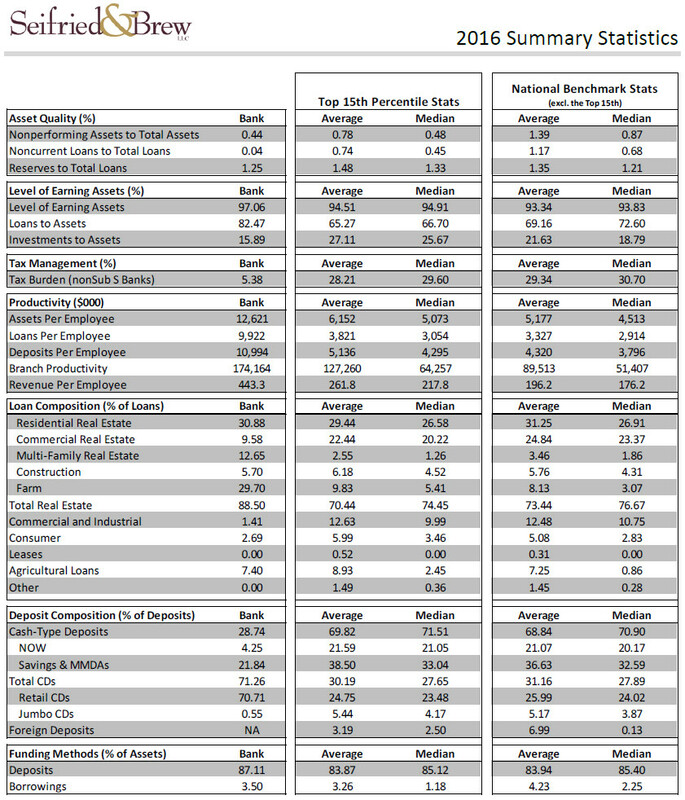 Total Farm Loan data was obtained by the ABA from the FDIC in 1Q of 2018. "ABA has been dedicated to providing advocacy, information, training and education for banks that make and service agricultural loans or provide credit and other financial services to those living and working in rural America for more than 100 years." Luana Savings Bank has begun construction on a new branch facility and 180+ occupancy community center in Polk City, IA immediately adjacent to our current facility. Since Luana Savings Bank became a part of Polk City in 2008, the city has been in need of a community center. The new facility is a sign of our gratitude for local support - past, present, and perpetually into the future. The new facility will also allow our staff to better serve existing and new customers. The new Polk City facility marks our second new construction featuring a community room in three years, and now more than half of our branches feature community meeting rooms. As Luana Savings Bank continues to grow, we also deepen our roots in the local communities that we serve. Luana Savings Bank is excited to announce our latest electronic banking feature, Mobile Deposit! Skip the drive and quickly deposit qualifying checks into your checking or savings account using the 'Luana Bank' Android or iOS mobile app instead. Enroll in Mobile Deposit today! Additional important details and limitations apply; please remember to endorse your items exactly as shown on our Mobile Deposit page. For the third time in 18 months, Luana Savings Bank has been recognized nationally as a top performing community bank. S&P Global Market Intelligence ranked Luana Savings Bank 90th in performance among 4,383 of its peers, and 4th best in the State of Iowa. To reach the top 2%, Luana Savings Bank exhibited excellent: returns on investment, efficiency, Texas ratio, net interest margin and loan growth. To be eligible for ranking, a Bank or thrift had to possess a loan-to-asset ratio of at least one-third and no more than half of those loans could be from credit cards. Further, the company had to be well-capitalized according to current regulatory standards and no more than half of the institution's revenue could come from nontraditional banking activities. Banks larger than, and with parent companies larger than $1 Billion in assets as of 2017 year end were excluded. Luana Savings Bank has exceeded one billion dollars in assets. As one of the largest banks in Iowa, we take pride in maintaining personal, community-bank values and a positive presence within our communities. Founded in 1908, Luana Savings Bank has proven itself as a stable institution, one of the oldest in the state of Iowa. We're continually recognized nationally for our high efficiency and great rates. We would like to thank our loyal customers for your business and continued support. Our mission is to deliver quality service to quality customers by quality employees at a quality price. Luana Savings Bank continues to be ranked nationally by the American Banker's Association (ABA) in their "Top 100 Farm Lenders Ranked by Dollar Volume" list which currently also includes 15 other Financial Institutions throughout Iowa. Total Farm Loan data was obtained by the ABA from the FDIC in 2Q of 2017. Luana Savings Bank has been awarded a 2017 Top Workplaces honor by the Des Moines Register. The Top Workplaces lists are based solely on the results of an employee feedback survey administered by WorkplaceDynamics, LLC, a leading research firm that specializes in organizational health and workplace improvement. Several aspects of workplace culture were measured, including Alignment, Execution, and Connection, just to name a few. The West Des Moines Register has announced Luana Savings Bank as a Metro's Best first-round winner in the Bank/Credit Union division in West Des Moines. The first place winner from each of the categories in each community is going head-to-head with the category winners from the other communities for the chance to be named The Des Moines Register Metro's Best. Contestants were written-in and voted for by members of the public from June 13th through the 23rd. Final voting will be held online September 26th through October 8th, 2017. 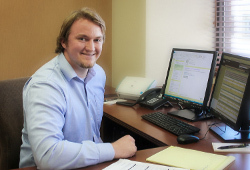 Luana Savings Bank is happy to announce the hiring of Ben Larson as a Loan Officer at their New Hampton branch. Ben graduated from New Hampton High School in 2012 and continued his education at Wartburg College where he graduated in 2016. Ben formerly served at Hogan-Hansen, P.C. in Mason City. Ben commented, "I am extremely excited to have the opportunity to work in the place where I grew up and call home. Coming back to New Hampton just felt natural to me. I love this town and I felt having that connection to the community and its members would no doubt help me in the banking business. I'm really looking forward to helping the community members with their credit needs." Ben is available to contact for any loan or credit needs. He can be reached at Luana Savings Bank’s New Hampton location at 1-800-394-2116. 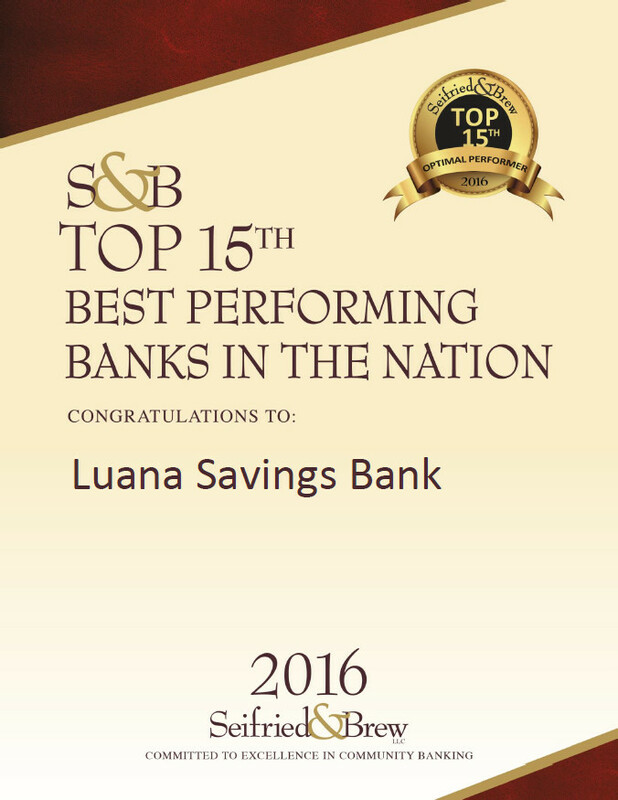 Seifried & Brew, LLC, a community bank consulting and risk management firm, ranks Luana Savings Bank as a high-performing bank in its prestigious 2016 S&B Top 15th Percentile. This designation is assigned to banks whose overall performance ranks them within the top 15 percent of all community banks in the nation. To receive this distinguished honor, Luana Savings Bank demonstrated exemplary performance by managing their exposure to risk while maintaining a notable level of reward. 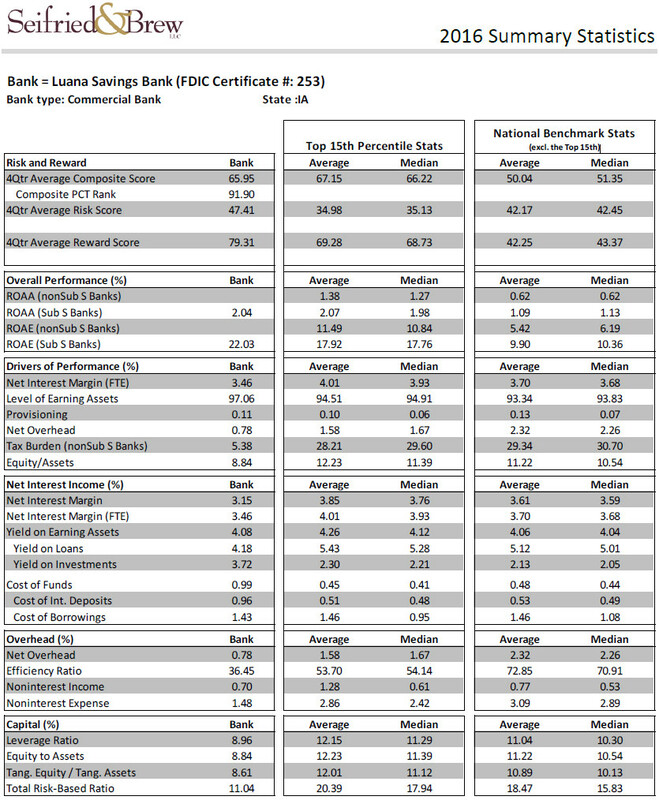 The ranking is based on the S&B index, which measures individual bank performance and then compares banks across the United States. The banks included in this index have assets between $10 million and $30 billion. The S&B Top 15th Percentile ranking has been released every year since 2011. Whereas other organizations rank bank performance, the S&B composite score takes into consideration both risk and reward. "The S&B Top 15th ranking says to bank customers that their bank demonstrates exemplary management and safety as an institution." states J.C. Brew, president & CEO of Seifried & Brew.